Two or more broken promises: When the customer fails to pay when he or she verbally promised during a soft collections call, or if the customer won’t pay overnight, by credit card, or use internet payment portal. These responses tell you that the customer will not or is not able to pay under your existing terms. You hear nothing-but-crickets: If you call and the telephone is disconnected, or if your emails bounce back with an undeliverable message, or if the customer’s website and/or social media platforms are suspended. These indicate your customer has closed or is changing doing-business-as names. Neither bode well for successful payment within terms. Always-an-argument: Some of our customers tell us that after many years of successful relationships, their accounts create sudden disputes over previously established terms, or begin repeatedly requesting proof or documentation, which is a common delay tactic that masks an excuse (see my earlier blog on excuses.) 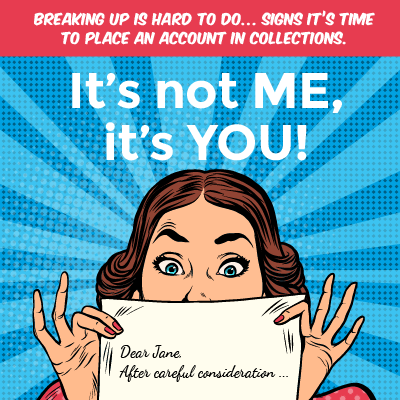 Other times, we hear from collections customers that customers don’t adhere to payment terms, payment schedules, or simply argue over payment. All of these provide strong indication of cash flow problems with this account. We are fortunate that the U.S. economy has been relatively good, since recovery from the recession of 2009-2010. However, in just one year, an average of 20% of all addresses change, 21% of all CEO’s change, 18% of all phone numbers change and nearly 5100 companies will file chapter 11 bankruptcy. Don’t staff up, let NACM Business Credit Services step in. We’re now offering a way for you to let us manage your aging accounts before your company turns them over for collections. Our goal is to help you separate yourself from debtors so you can spend time with your most loyal customers. If you have a question, please call us anytime at 800-432-5710. Paul Krause serves as Collections Manager with NACM Business Credit Services, and has been with the organization 14 years. Take advantage of this depth of experience in the credit and collections profession that he and his colleagues offer.